How can Clapham and Stockwell be transformed into places where adults and children feel safe and comfortable cycling around? Clapham and Stockwell are important residential, leisure and commercial centres within Lambeth which people from across the borough and from further afield travel to. These areas are well provided for by public transport and have some of the lowest levels of car ownership in the UK. And yet the area is dominated by motor traffic with major routes along the A3 at Clapham High Street and Clapham Road, the A205 South Circular and the A203 South Lambeth Road. 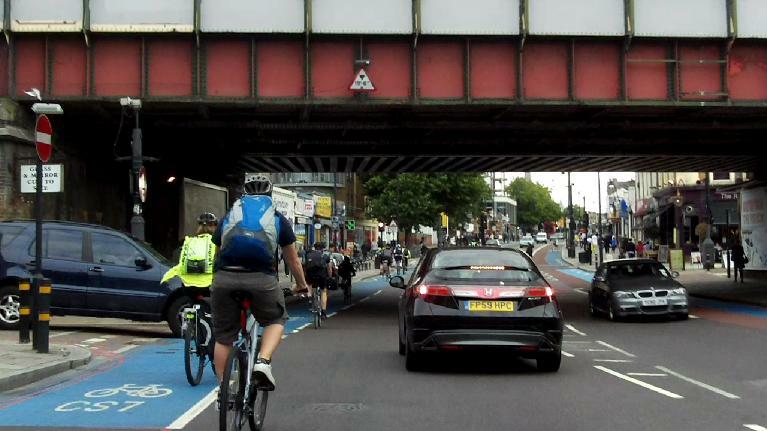 Although improved over the past 10 years many Clapham and Stockwell roads remain intimidating; not just to children but also to many people who would cycle if it were made pleasant to do so. These areas have very cycle friendly routes available across the Common, along London Cycle Network Route 3 and potentially with all the Old Town improvements being undertaken but in many cases these fail to adequately link up with other roads and so cyclists are forced back on to fast moving routes. Cycle Superhighway 5 promotes a fast route for commuters up to the city and West end but can feel dangerous outside of rush hour times when there is a sense of safety in numbers..
What changes need to be made for Clapham and Stockwell to become places where people of all ages cycle without fear to friends, to shops, to school, or to work? How can we make Space for Cycling? This is the fourth in a series of five monthly meetings around Lambeth providing a chance to meet Lambeth Cyclists, the borough group of the London Cycling Campaign, and discuss the neighbourhood changes needed to make cycling the easy and obvious choice for local journeys. If you live in, work in, or travel through Clapham Common, Clapham Town, Ferndale or Stockwell wards then please come along.